They say that, when it comes to perfume, all that matters is the juice. Well, I disagree. Or should I say that I agree to an extent. The scent is, first and foremost, the most important part, after all, marvelous packaging cannot save a disastrous fragrance from smelling awful now, can it? But when a bottle and fragrance are both masterful one can really enhance the other to create a truly luxurious object. 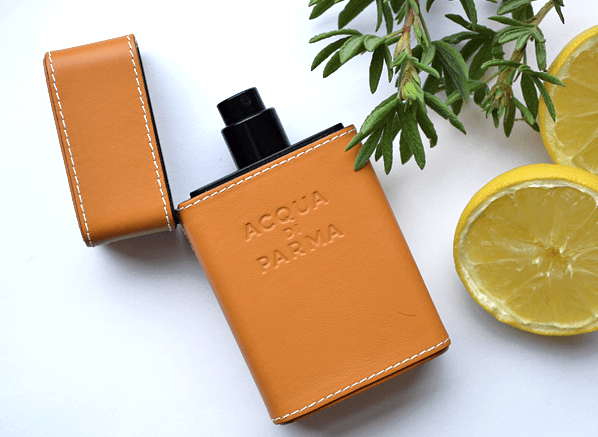 One such object is the brand new travel spray for Acqua di Parma’s iconic Colonia. Now, Colonia is already a bloody lovely scent, but when housed within the tan leather of the travel spray well, it is really quite something to behold. For my Escentual column this week, I’ve taken a good old look at this wonderful new object and have also rambled on about, amongst many other things; myself, Vivienne Westwood bags and Ferraris. If that piques your interest, click here to give it a read. Image and sample via Escentual. I write for Escentual as their Fragrance Expert. My views are my own. Posted in Acqua di Parma, Cologne, Escentual and tagged Acqua di Parma, Cologne, Colonia, Eau de Cologne, Escentual, Perfume Review, Travel Spray. Bookmark the permalink.